Ask someone how they'd detect whether a SQL Injection vulnerability exists in a web application and they're likely to suggest putting a single quote into a parameter in the application. Then, if they received an error, they could infer the presence of an SQL Injection vulnerability. Don't be surprised if you come across someone defining SQL Injection as Single Quote Injection. In this blog post, we discuss the research on Fragmented SQL Injection where the hackers control two entry points in the same context in order to bypass the authentication form. 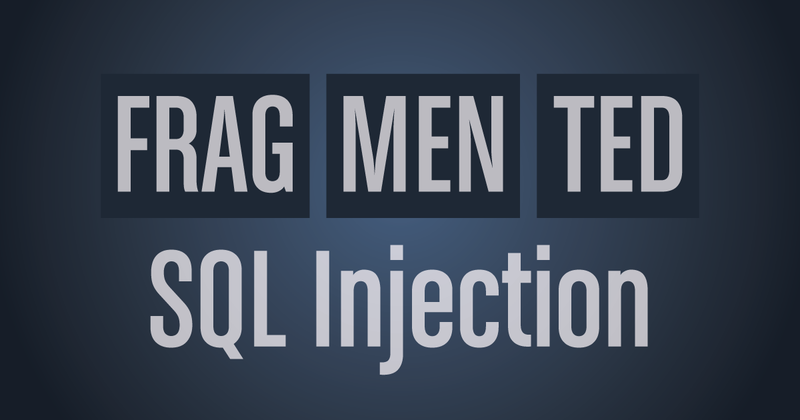 Let’s take a quick look at the importance of single quotes in SQL injection attacks. In a system (command interpreter, file system or database management system, for example), characters that have special meanings are called metacharacters. For instance, in the SQL query context, single and double quotes are used as string delimiters. They are used both at the beginning and the end of a string. This is why when a single or double quote is injected into a query, the query breaks and throws an error. Here’s an example of where the quotes are placed in the query. So, when a single quote is injected into the entry point above, the query interpreter will either complain about invalid syntax or report that it can’t find the quote’s pair at end of the string. $query = "SELECT * FROM users WHERE username='".$username."'" The system will throw an error for the single quote left unpaired at the end of the query. This is only valid for the string context. There is no need to inject single or double quotes into the context below, since the id parameter doesn’t expect a string. In the example above, in order to perform an SQL injection, you have to input a numeric value, and the following values will then be evaluated as part of the SQL command. The error returned due to the injection of a single quote may signify that the input from the user was not filtered or sanitized in any way, and that the input contains characters that have special meaning on the database. Let’s take a look at an instance where the single quote is blacklisted or escaped from the command. As you see in this example, because the single quote (‘) is escaped with a backslash, the payload does not work as intended by the hacker. Fragmented SQL Injection (not a term used by its inventor Rodolfo) takes place when two input points are used jointly to bypass the authentication form. If hackers can control multiple points, and the values from these points are in the same context, they can use fragmented payloads to circumvent blacklists and character limits with this method. The backslash neutralizes the following single quote. So the value for the username column will end with the single quote that comes right after password= (the end of the gray text). Doing so will eliminate the required password field from the command. Due to the or 1 command, the condition will always return 'true'. The # (hash) will ignore the rest of the function, and you’ll be able to bypass the login control and login form. Please note that the blog post we referenced in this article suggests using the htmlentities() function in PHP to filter inputs, as a way to prevent the attack we described above. If you set the ENT_QUOTES flag, HTML encoding will convert single quotes, double quotes, and tag opening and closing signs, to their corresponding HTML entities. For example, a double quote would be encoded as '&quot;'. However, this not the ideal solution, because there are situations where single or double quotes are not required to fulfill an SQL injection attack. In addition to that, some old school techniques like GBK Encoding can be used to bypass preventions like the addslashes() function in PHP and this weakens the overall prevention mechanism. At Netsparker, we believe that the correct and proper solution to prevent SQL Injection attacks is to use Prepared Statements, otherwise known as Parameterized Queries. Parameterized Queries allow you to separate the structure of the SQL query from its values. All remaining methods to prevent SQL injection attacks may be bypassed in the near future with neat tricks such as that of Chris Shiflett, and are therefore not reliable. Developers still use blacklists to prevent the SQL Injection vulnerability. They do this either manually or using functions designed for this purpose (e.g. addslashes). However, we encounter new tactics in information security every day that attempt to bypass these blacklists. Ultimately, the best way to prevent injection based flaws like SQL Injections is to use a Prepared Statement. This is the only effective way developers can teach the system not to evaluate user controlled parameters as part of the query structure.